Sierra Online finally brings one of the most popular card games to Xbox Live with their latest Arcade release, “Gin Rummy”. Ahh, Gin Rummy. I have vivid memories of each passing summer vacation, where I would join the other members of my family for hours of Gin Rummy during the vacation downtime. To this day, it’s still practically a family tradition that no one will let die. Plenty of people all over our crazy little planet love Gin Rummy for one reason or another, but the simple fact remains that it’s not as popular as poker these days, what with all of those poker websites and the dozens of poker video games released across all consoles and the PC. So, how does this game compare to the other Xbox Live Arcade card games? Have a seat with me and play a few rounds of “Gin Rummy”, so we can find out exactly how good this little game is. If you want to hear about graphics, go look at another review or play something else. When it comes to card games, there’s no point in even talking about the graphics because it’s always the same thing; Pretty backgrounds and a bunch of cards. Gin Rummy” is no different from other card games in this respect. The sound track is pretty standard for a card game, including all sorts of relaxing songs, mostly taken from the Jazz genre. As for the sound effects, what do you expect? Card sounds are just about the only thing you’ll be hearing. The real meat of “Gin Rummy” is of course the actual gameplay. Beginners should feel very welcome here, as there is a hand-holding tutorial of sorts that will break even the newest players in to the game very quickly. Once you’re comfortable with the rules of the game, you may choose from 6 main game types. 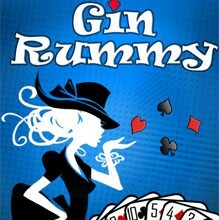 “Classic Gin Rummy”, “Oklahoma Gin”, “Hollywood Gin”, “3-hand Gin”, “Speed Gin Rummy” and “Custom Gin Rummy”. Each game type feels quite different from the others, although “Custom Gin Rummy” is nothing more than a simple method to change the game and match points before you play and should have just been included withh each game type by default instead of as it’s own game type. There’s also Xbox Live multiplayer in both player and ranked formats, which should provide endless hours of fun for anyone who can get into it. The same general game types and options are available online as those of the single player experience, but the game itself can be extremely difficult when playing with a group of experiences players online. This title also supports the Xbox Live Vision camera, so players can swap out their gamerpic with a live video feed for everyone else to see. This adds a nice touch when everyone has their camera turned on, but that doesn’t always seem to be the case. Still, this is a great game that any fan of card games is going to fall in love with. Overall, Sierra Online has done a wonderful job of bringing this classic card game to live on the Xbox Live Arcade and I’m sure that this isn’t the last card game we’ll see on the service, either. -Ranked and unranked online formats. -Supports Xbox Live Vision camera. -As far as this type of game goes, there are no real cons. Simply put, this game is perfect for any fan of classic card games and obviously that applies especially to fans of Gin Rummy in particular. If you fit this description, you should probably buy this game. As an added bonus, it’s only $5. NOTE: I refuse to score the graphics of a classic card game, so that will not be included in my final score. It’s unfair and absolutely pointless.